Salsa is the Spanish word for sauce, and in Mexico it refers to sauces that are used as an ingredient for a variety of dishes and as a condiment. Most salsas are especially spicy, due to the prominence of hot chili peppers in their ingredients. Literally hundreds of such sauces exist, including piquant fruit salsas. In the United States, salsa resembles a spicy tomato sauce from Mexico called salsa cruda, or raw salsa, and is used primarily as a condiment, especially with tortilla chips. In 1991, salsa outsold ketchup as the most popular condiment in America. Today, salsas account for almost half of the sauces sold in the United States. In 1992, salsa accounted for $802 million in sales; that figure is expected to reach $1 billion by 1995. Salsas have been know for a thousand years in Mexico, yet salsa as we know it today is a fairly well-balanced blend of both Old World and New World ingredients. The tomatoes, tomatillos, and chilies found in salsa are native to this hemisphere, while all the other ingredients, such as onions, garlic, and other spices, are Old World in origin. Mexican cuisine has traces of Aztec, Spanish, French, Italian, and Austrian influences. The ingredients of salsa began in places as diverse as India and the Near East, yet most of them had established firm footholds in Europe before Spain's conquest of Mexico in the early sixteenth century. Hence, most of the ingredients can be attributed to Spain's influence on Mexico. Mexican cuisine is traditionally noteworthy for its time-consuming preparation. Foods such as mole are complex blends of pulverized spices, fruits, chocolate, or other ingredients that can take days to prepare. Fresh salsa used to be made using a molcajete and a tejolote, or mortar and pestle. This device, originally made from black basalt, has been in use for 3,500 years to prepare a variety of foods. Mass-produced salsas come in different varieties. The basic formula for salsa consists of tomatoes and/or tomato paste, water, chili peppers (green, yellow, serrano, and/or anaheim), optional jalapefio peppers, vinegar, onions, garlic, green bell peppers, and spices, including black pepper, cilantro, paprika, cumin, and oregano. The most common alternative salsa is salsa verde, made with tomatillos. Of the same genus (Physalis) as the ground cherry grown in the southern United States, tomatillos are tart, green fruits grown inside papery pods that replace red tomatoes in the basic salsa recipe. Other special formulas may have green tomatoes, carrots, black-eyed peas, or even cactus as ingredients. Most commercially prepared salsas also contain additives. These include salt, sugar, vegetable oil, calcium chloride, pectin, modified food starch, xanthum gum, guar gum, dextrose, and potassium sorbate. Beet powder and canthaxanthin can be added for color, and sodium benzoate or citric acid can be added as preservatives. 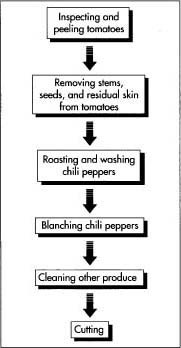 The initial steps in making salsa involve inspecting, peeling, and stemming tomatoes; roasting, washing, and blanching chili peppers; and cleaning other produce. The vegetables are then cut using standard machines pre-set to the desired level of fineness. To make chunky salsa, the vegetables are usually diced while the fresh cilantro is minced. To make smoother salsa, all the vegetables are processed to the same consistency as the tomatoes. tomatoes, peppers, and onions, from growers. Other ingredients, such as vinegar, tomato paste, spices, or additives, are purchased from manufacturers in processed form. 2 The tomatoes are first inspected, then peeled using lye. The stems, seeds, and any residual skin are then removed. Some salsa manufacturers roast their green chili peppers before washing them. Next, the stem, seeds, and calyx are removed. The chili peppers are then blanched, and the pH value, or acid count, is adjusted using citric acid. 3 All other produce is cleaned by passing the vegetables through tanks of water or by spraying under high water pressure. The inedible parts of these vegetables (such as garlic peel, stems, or onion skins) are removed by processing machines. The vegetables are then cut using standard machines that are pre-set to the desired level of fineness. To make chunky salsa, the vegetables are usually diced while the fresh cilantro is minced. To make smoother salsa, all the vegetables are processed to the same consistency as the tomatoes. 4 Most salsa is not fresh due to long-distance transport of the product from manufacturing plants to retail outlets. Because it is important for the product to have a long shelf-life, heating the salsa is necessary to prohibit the growth of mold within the container before purchase. Most salsa, however, is minimally processed. The tomato paste or processed tomatoes, water, vinegar, and spices are placed in a pre-mix kettle that is large enough to hold several batches of salsa. This mixture is then placed in a batch kettle along with the other ingredients such as onions and chili peppers. Salsa may be slow or fast cooked, or, in the case of fresh salsa, steam cooked. Cooking time and temperature vary; the slow method subjects the salsa to a low temperature of 163 degrees Fahrenheit (71 degrees Celsius) for 45 minutes, while the fast method subjects the salsa to a high temperature of 253 degrees Fahrenheit (121 degrees Celsius) for 30 seconds under pressure. 5 After cooking, the salsa is ladled into glass jars, plastic bottles, or other containers that are usually made from heat-resistant polyethylene or polypropylene. Fresh salsa is placed into the container cold and then steam heated, while cooked salsa is placed into the container while it is still warm. The machine that fills the containers does so by volume. 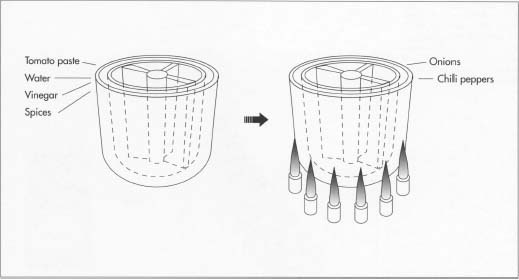 The jars or containers are then sealed and cooled in cold water or air. This process vacuum-seals the product because the heated salsa cools and contracts, producing a partial vacuum under the seal. 6 Jars and plastic containers that are not preprinted with product information are labeled and then packed in corrugated cardboard boxes to be shipped to stores. Once prepared, the tomato paste or processed tomatoes, water, vinegar, and spices are placed in a pre-mix kettle that is large enough to hold several batches of salsa. This mixture is then placed in a batch kettle for cooking along with the other ingredients such as onions and chili peppers. Cooking time and temperature vary; the slow method subjects the salsa to a low temperature of 163 degrees Fahrenheit for 45 minutes, while the fast method subjects the salsa to a high temperature of 253 degrees Fahrenheit for 30 seconds under pressure. each batch is sterile and safe. Salsa manufacturers that do not use preservatives in their product must be even more careful that mold does not grow during its shelf-life. All incoming produce and spices must first be inspected for quality. To mass-produce salsa, an important criterion is that the vegetables be consistent so that batches will not differ in quality, color, or flavor. Consistency is very important in the case of chili peppers, as the degree of hotness must be in a stringently determined range. A jar of salsa labeled "mild" should have a slightly piquant flavor that does not overwhelm the timid salsa consumer. Conversely, a jar of salsa labeled "hot" should not disappoint the braver salsa consumer. Chili peppers are selected by choosing specifically categorized seeds or germ plasm to be grown into the chili peppers intended for salsa. Chili peppers range in hotness—from the mild bell pepper to the hottest known pepper, the Scotch bonnet—although most salsa manufacturers will only go as high as jalapefio. The system used to classify chili pepper hotness is the Scoville Units method. It determines the amount of water and time needed to neutralize the heat of the pepper after ingestion. The higher the Scoville Unit, the hotter the pepper. The hotter chili peppers are easily measured in the hundreds of thousands Scoville Units. Each type of pepper has several different levels of hotness to choose from, and the salsa manufacturer selects the peppers that will provide the necessary degree of hotness for each blend. Once the salsa is prepared, it is tasted by experienced tasters to see that it meets acceptable standards of flavor and hotness. The equipment used to prepare salsa is cleaned and inspected daily. Equipment is cleaned with chlorides, quaternary ammonias, or any substance that is effective against bacteria, then rinsed thoroughly. A swab test, which consists of rubbing a cotton swab over a small surface area of the kettle, is then done for each kettle. The sample is then placed in a solution of known dilution, put on a dish, and placed in an laboratory incubator. After one or two days, the sample is checked for microbes. The number of harmful organisms is multiplied by the total affected surface area of the kettle to arrive at the total number of microbes. Many samples of finished salsa are taken, and the samples undergo the same treatment and testing as those samples taken from the equipment. 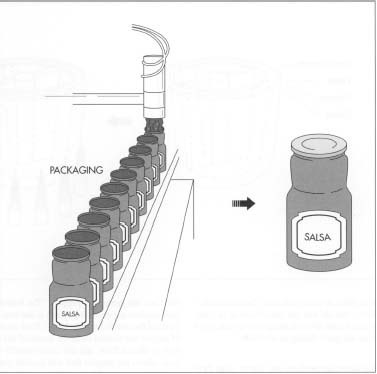 Salsa factories are regularly inspected by the Food and Drug Administration (FDA), as well as state food regulatory inspectors. Salsa is packaged automatically using large machines that vacuum-seal the glass or plastic jars after filling them with the appropriate amount of salsa. Salsa's surging popularity has made it the most popular condiment in the United States. Birosik, P. J. Salsa. Macmillan Publishing, 1993. Esquivel, Laura. Like Water for Chocolate. Doubleday, 1992. Fischer, Lee. Salsa Lover's Cook Book. Golden West Publishers, n.d.
Leonard, Jonathan Norton. Latin American Cooking. Time-Life Books, 1968. McMahan, Jacqueline H. The Salsa Book. The Olive Press, 1989. Miller, Mark. The Great Salsa Book. Ten Speed Press, 1993. Petroski, Henry. The Evolution of Useful Things. Alfred A. Knopf, 1992. O'Neill, Molly. "Salsa Nova," New York Times Magazine. June 14, 1992, p. 61. Sokolov, Raymond. "Before the Conquest: Thousands of 'Mexican' Dishes Could Not Have Existed Before Cortes," Natural History. August, 1989, p. 76. Stern, Gabriella. "Yanquis Are Finding Wide-Ranging Uses for Salsa and Picante," Wall Street Journal. January 19, 1993, pp. B1, B8.